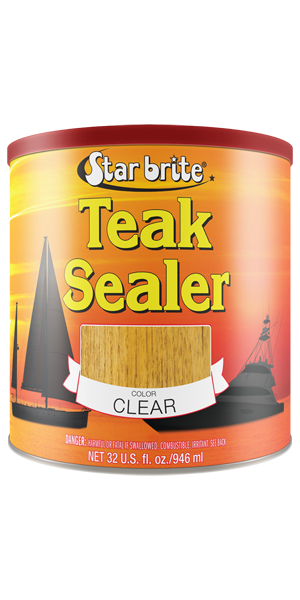 Star brite® Teak Sealer lasts longer than traditional sealers. Its UV-inhibitors prevent weathering, fading, and provide more overall protection. Formulated for an easy, no-drip application, it’s ideal for vertical surfaces. Advanced polymers help repel moisture and preserve color on teak and other fine woods. Always start with a clean surface. For graying or dirty wood, clean thoroughly with Star brite Teak Cleaner. If sanding teak, you must clean the surface before sealing, making sure to remove any loose wax or pitch. Follow with Star brite Teak Brightener—it not only enhances the grain and patina of the teak, but also opens the pores of the wood, allowing Teak Sealer to penetrate more evenly and provides maximum adhesion and performance. If any stains, black streaks, or dirt marks still remain, use Star brite Teak Scrub while teak is wet to remove all discolorations. Allow teak to dry completely before applying sealer. Mix sealer by shaking or stirring. Once open, use a mixing stick to stir any solids on the bottom of the container into solution. Apply product with a foam brush in the direction of the wood grain, using short, even brush strokes to obtain a uniform finish. Continue application across entire surface, ending strokes at natural break points, such as a seams. Once complete, apply a second coat to ensure an even, clear finish. Brush marks or uneven spots? Easily corrected by rubbing with a clean, dry towel in the direction of the wood grain before sealer dries. Clean any spills or drips immediately with mineral spirits and a clean rag. Sunlight/UV-exposure will speed drying time. Clean wear and tear from heavy traffic areas with Star brite Boat Wash or diluted Star brite Teak Cleaner, and allow to dry. Touch up scuffed or scratched spots by applying Teak Sealer. Blend into surrounding area with a clean, dry cloth. Touched-up area will blend in with other treated teak upon drying. Star brite Teak Sealer will slowly fade as it ages, instead of turning black. At that time, follow these direction completely to refinish surface. If for any reason sealer needs to be removed safely, quickly and efficiently, use Star brite Gel Formula Teak Cleaner/Restorer. Extra long lasting protection for teak. Use instead of bronze wool in all heavy cleaning applications.